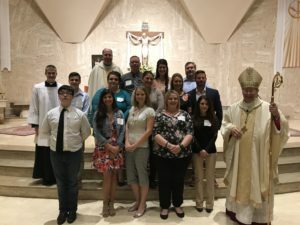 At its core, the Rite of Christian Initiation of Adults (RCIA) is a program for people who would like to know more about the Roman Catholic faith. Its most obvious application is for those who desire to be received into full communion with the Catholic Church. RCIA is the process by which interested people learn about, participate in, and eventually become fully initiated members of the Catholic Church. We believe it should be a period of reflection, prayer, instruction, discernment, and formation. Yet, even the most robust, well-structured and successful RCIA program is not simply a one-time experience in catechetical instruction; rather, it is truly the beginning of a life-long conversion process. This RCIA page is created with both our RCIA aspirants as well as our entire parish in mind. We hope it provides an additional resource for information on the Catholic faith for those seeking to walk ever closer to Christ. We fellow Catholics realize that Christ’s call to follow Him involves a journey of life-long conversion. For more information on RCIA, please contact the Parish office at 573-635-7991 or info@cathedraljc.org. The RCIA Classes for the 2017-18 year will be held on Monday evenings from 6:15 – 8:15 p.m. in the Cathedral School. Our first class will be Monday, September 11, 2017.